From the first motorcars (which didn't even have doors) to everyday wonders and alternative tech, these are our all-time favourites. In a little over a century, the motorcar has managed to innovate almost beyond recognition. But it remains true to the original recipe; there are still four wheels, some seats and bodywork, a wheel and pedals to control, and roads to drive on. Powertrain options have included steam, electricity, petrol, diesel, hydrogen and even jet propulsion. Styles have come and gone, safety standards have evolved, performance has gone into the stratosphere, and now we are seeing autonomy take hold in a way that few would have predicted a decade ago. Here, we look at some of the most innovative cars of all time. From where it all started with the Benz Motorwagen, through highlights including the original Mini, Beetle and Land Rover, to supercars, electric vehicles, and the autonomous, sans-steering wheel cars of our near-future. The motorcar as we know it today was born in 1885 with the production of the Benz Patent-Motorwagen. It may have only had three wheels and 0.75 horsepower, but Karl Benz’s two-seater is widely regarded as the first car. Power (or the lack thereof) came from a 954cc, one-cylinder engine installed in the rear of the vehicle’s tubular steel frame. Production lasted for two years and later models upped the power output to 2hp, giving the car a top speed of 10mph. There wasn’t anything as extravagant as doors, windows, a roof or body panels of any description, but that didn’t matter. This was genesis for the motorcar, so as innovations go, it’s a big one. Making a handful of cars – or the 25 Motorwagens produced by Benz – is all well and good, but what happens when you need to build thousands, or millions? This was where Henry Ford’s innovative assembly line production method came into play. Between 1908 and 1927, Ford produced 16.5 million Model Ts, and by 1918 it accounted for half of all cars on US roads. Since then, the production line has been adopted by just about every car maker. The original Beetle’s lasting mark on the motorcar should have been left when it was conceived in 1931 as a ‘car for everyone’ by Ferdinand Porsche. The birth of the civilian off-roader – better known today as the SUV – took place on a Welsh beach in 1947, when Maurice Wilks drew in the sand a sketch of a car he felt would be better than the US Army’s Willys Jeep. The car he drew went on to become the original Land Rover, later called the Defender. It launched at the Amsterdam motor show in 1948 and created the blueprint for all off-roaders and SUVs to come. The Land Rover’s breadth of use earns it a place on this list, thanks to a chassis that was used for military and commercial vehicles, fire engines, ambulances, mountain rescue, airport vehicles and everything in-between. As utilitarian as the Land Rover is, the company spotted a gap in the market in 1967 for something completely different. Brazenly tested in public with none of today’s camouflage, the original Range Rover wore badges stating Velar instead of Land Rover as its only disguise – such was the unlikelihood that the company would produce something so far-removed from the original recipe. But it did, and from then on the Range Rover bloodline has led the luxury SUV field from its inception to the present day. Today, Porsche, Bentley, Rolls-Royce and even Lamborghini have joined the SUV race, some with higher price tags and others with increased performance. But while they all offer other models, Range Rover remains the only brand dedicated exclusively to the luxury SUV. The original Mini’s innovation lay in its compact packaging. The small engine was fitted transversally instead of longitudinally, which meant a smaller engine bay and more space for the passenger compartment and storage. Sure, the rear crumple zone was your suitcase or the weekly food shop, but Alec Issigonis’ design quickly became one of the most iconic of all time. 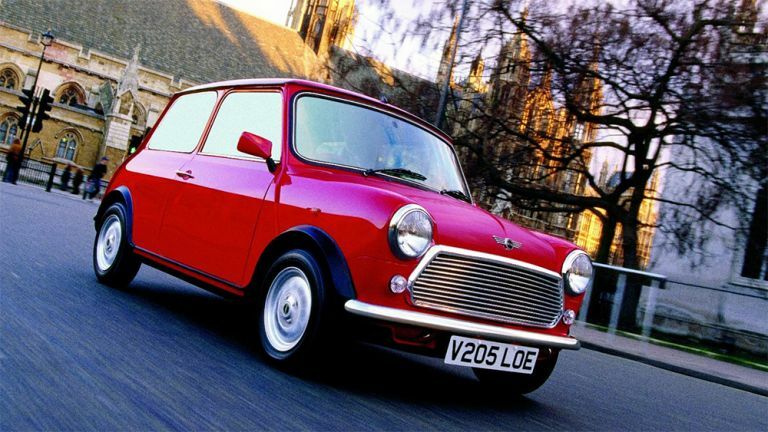 The Mini’s place in automotive history was secured when Cooper S versions of the compact family car unexpectedly won the Monte Carlo Rally in 1964, 65, 66 and 67 – partly thanks to that space-optimising design putting the Mini’s wheels right in the corners, creating the famous ‘go-kart like’ handling that the brand still dines out on today. The GTI lost its way a little in the 90s and 00s, but today’s is among the very best hot hatchbacks on sale, while still being true to the original – right down to the tartan seats. For many, the hot hatch story began with the 1975 Volkswagen Golf GTI Mk1. Standing for ‘gran turismo iniezione [injection]’, the GTI’s recipe was a simple one; take a small, light family car and give it extra power. Tweaks to the engine meant power increased from 75bhp to 108bhp. This may seem modest by today’s standards, where a Ford Focus RS hot hatch has 345bhp, but it meant the little Golf could haul its scant 810kg up to 60mph in nine seconds and to a top speed of 110mph. Just as Volkswagen can lay claim to inventing the hot hatch, we must thank Lamborghini for giving the world the supercar – or, at the very least, the first production sports car to have a mid-engined layout. Launched in 1966, just three years after Lamborghini switched production from tractors to cars, the Miura was unlike anything the world had ever seen. Low, wide, and with a dramatic clamshell that folded back to reveal its 350-horsepower, 4.0-litre V12 engine, the Miura took the crown of world’s fastest car, with a top speed of 170mph. It took Ferrari seven years to launch a mid-engined counter strike, in the form of the 365 GT4 BB, and just a year later Lamborghini was back with the even more outrageous Countach, whose bloodline can be followed right up to today’s equally extravagant Aventador. Truth be told, the S-Class could have featured on this list several times over. Technology that debuted on the Mercedes flagship over the years included crumple zones in 1957, an electric anti-lock braking system in 1978, SRS airbags, three-point seatbelts, and the first mass-produced turbocharged diesel engines. The S-Class also featured traction control and stability control back in 1995, and has persistently been a leader in autonomous safety systems such as Brake Assist, Lane-Keep Assist, and the use of infrared to spot pedestrians at night. While the Ferrari F40 is the purist’s 80s supercar, the Porsche 959 should be remembered as the most innovative. It brought all-wheel-drive to a supercar for the first time, boasted active hydraulic suspension, and its ride height was automatically lowered to improve high-speed stability. The 959’s electronic tyre pressure monitoring system was the first ever fitted to a road car, and it had some of the world’s first run-flat tyres. This car also impressed with its ability to blend performance with everyday comforts, almost matching the Ferrari F40’s pace, but including luxuries such as leather seats and air-conditioning. The F1’s genius lay in its practicality and breadth of ability. This vehicle had seating for three people and air-conditioning, yet could reach 240mph and is still widely considered to be one of the greatest supercars ever made. If the driver travelled with one passenger, luggage space was an impressive 281 litres. Launched in 1993, the McLaren F1 was the first road car to feature a carbon fibre monocoque, and it famously used gold leaf to help insulate the engine bay. Other exotic materials included magnesium for the wheels and titanium for the toolkit. Also way ahead of the curve was the fact that the F1 had its own modem (from 1993!) that connected to the McLaren factory in Woking and transmitted data from the car to help mechanics troubleshoot problems. Many would expect the Tesla Model 3 to make this list, but until the company actually starts selling the $35,000 electric-car-of-the-people it promised, we have opted for the Model S.
The Model S has helped show the world how electric cars should be. It blends the sensibilities of a five seat saloon car with the outrageous acceleration of a hypercar – reaching 60mph in 2.4 seconds – while demonstrating how car charging infrastructure really can work. Once the might of VW and the rest of the traditional car market gets up to speed on electric cars, Tesla will have an almighty fight on its hands. But even if it disappears into obscurity, Tesla can proudly say it – not VW or Ford or General Motors – kick-started the electric car revolution. Although not a production car by any stretch of the imagination – and now replaced by a fleet of modified Chrysler minivans and Jaguar I-Paces – the Firefly gave the world its first proper look at what life with fully autonomous cars might be like. Its cute face and harmless design helped make the technology underneath more approachable as it ferried blind people to the shops in shiny promotional videos and racked up millions of autonomous test miles. But, ultimately, this was just an experiment. Even Google isn’t interested in actually building its own driverless cars at any scale. Firefly lived a short life, hitting the streets of California in 2014 and being retired just three years later.